“The BMW K1300R is a naked motorcycle launched at the end of 2008 to replace the K1200R as BMW’s flagship urban motorcycle. The K1300R produces a claimed 173 hp (129 kW) @ 9,250 rpm from its 1,293 cc Inline-four engine with torque of 140 N·m (100 lbf·ft) @ 8,250 rpm. The engine was subtly modified by British company Ricardo plc. It has an exhaust butterfly flap to boost torque and improve exhaust note. 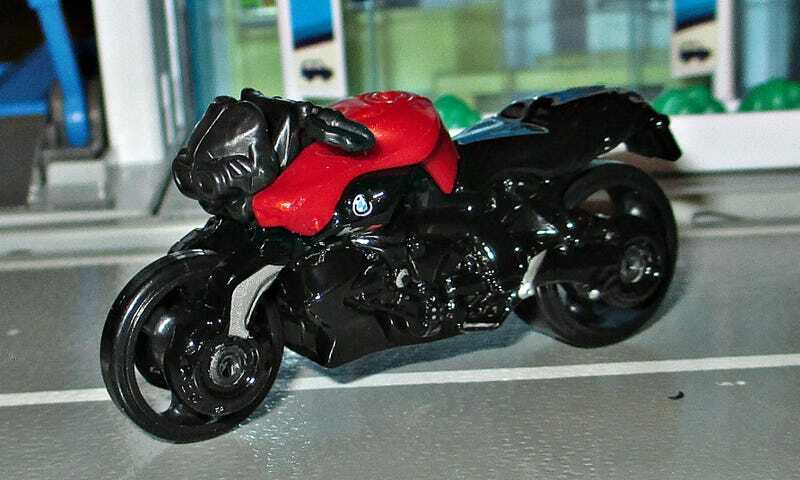 The K1300R features BMW’s optional ESA-II electronic suspension adjustment. The bike also has a conventional indicator switch instead of the usual BMW three button configuration. In tests carried out by Bike Magazine in the UK, its 2.81 second 0–100 km/h (0–62 mph) time made it the fastest accelerating muscle bike, beating its next closest competitor, the Suzuki B-King, by one tenth of a second.” Well, that’s fast! It’s a current Hot Wheels, in case you were wondering.